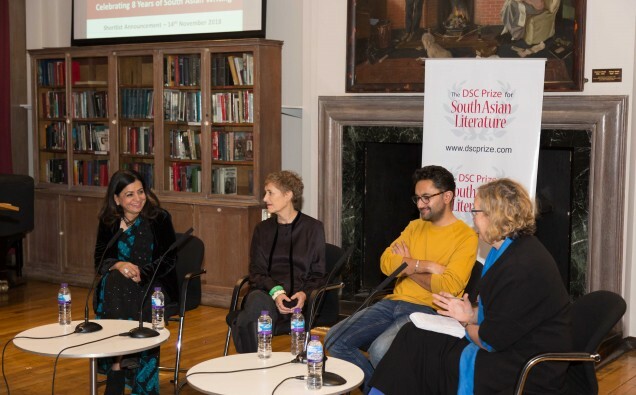 14th November 2018, LONDON: The much-anticipated shortlist for the DSC Prize for South Asian Literature 2018 has been unveiled at a special event, which took place at the London School of Economics & Political Science. Now in its 8th year, the DSC Prize for South Asian Literature is one of the most prestigious international literary awards specifically focused on South Asian fiction writing. The announcement evening also featured a special panel discussion moderated by Claire Armitstead, Associate Editor, Culture, for The Guardian on the Importance Of Literary Prizes, with Alexandra Pringle, British publisher and editor-in-chief of Bloomsbury Publishing, and Sathnam Sanghera, British writer and author. Administered by the South Asian Literature Prize & Events Trust, the prestigious DSC Prize for South Asian Literature has helped to raise the profile of South Asian writing around the world by rewarding authors who write on the region. Founded in 2010 by Surina Narula and Manhad Narula, the winning author is awarded a US $25,000 prize. highlighting the growing interest of publishers and authors across the world in South Asian writing. The shortlisted entrants reflect this global interest, including British-Pakistani author Kamila Shamsie and Indian origin author Neel Mukherjee who are both based in the UK. Pakistani origin author Mohsin Hamid is based between Pakistan, UK and the USA, whilst Sujit Saraf is based in the USA. The growing global importance of South Asia coupled with the sweeping changes that are affecting the lives of the people here has encouraged more and more diverse writers to write about this region. This year’s international jury panel includes Rudrangshu Mukherjee, Jury Chair, Professor of History and the Chancellor of Ashoka University and an internationally acclaimed historian of the revolt of 1857 in India , Nandana Sen, a writer, actor and child-rights activist and author of six books, who has worked as a book editor, a poetry translator, a screenwriter, and a script doctor, Claire Armitstead, who has also been a theatre critic, arts editor and literary editor, Tissa Jayatilaka, who was the Executive Director of the United States-Sri Lanka Fulbright Commission and is the author of several publications and has translated and edited many journals, and Firdous Azim, Professor of English at BRAC University, Bangladesh, whose research has focused on women’s writings in the early twentieth century Bengal. Following the announcement of the shortlisted entries, the jury will convene again to select the winning author, ahead of the final award ceremony to be held at the Tata Steel Kolkata Literary Meet which would take place in Kolkata, India between Jan 22 and Jan 27, 2019.